The Georgia Assessments for the Certification of Educators (GACE) is a family of exams designed to measure the knowledge and skills of those seeking certification as educators in Georgia’s public schools. GACE tests were developed by the state of Georgia in cooperation with the Educational Testing Service (ETS). College students in Georgia who seek degrees in K-12 education must make a passing score on the GACE Program Admission Assessment exam or have achieved comparable scores on the ACT, SAT, or GRE. What does the GACE Program Admission Assessment cover? The Program Admission Assessment measures the knowledge and skills of aspiring educators in three basic areas: reading, mathematics, and writing. The reading and mathematics sections are computer-delivered tests, each with 56 objective questions to be answered in 85 minutes. The writing portion of the GACE Program Admission test consists of 40 questions to be answered in 100 minutes. All but two of the writing questions are selected response questions. The remaining two questions require essay responses. How does a student register for the GACE? Test takers should check with their academic adviser about their degree program’s requirements. Students who need the Program Admission Assessment can find online GACE registration information, instructions for fee payment, and a schedule of testing dates and sites. Are testing accommodations available for the disabled? Yes. Test takers with disabilities or special health needs may apply for accommodations through their registration for an ETS GACE account. See the Accommodations page of the GACE site for application instructions. How is the GACE Program Admission Assessment administered? On the scheduled exam day, test takers should wear comfortable clothing and bring only a photo ID and their admission ticket to the testing site. Be sure that the names on the photo ID and the admission ticket match. Do not bring pencils, pens, paper, or a calculator to the Program Admission Assessment. The testing software includes a calculator to be used during the mathematics portion of the test. What is a passing score on the GACE Program Admission Assessment? Scores on GACE program readiness tests range from 100 to 300. A score of 250 is passing. How soon will I learn my scores? The Reading and Mathematics scores are released within a week of the test date. The Writing section of the test may take up to 28 days to score. How do test takers study for the GACE Program Admission Assessment? The best way to study for a test of basic academic knowledge and skills is to practice the kinds of questions that are likely to appear on the exam. Find out how well you analyze reading, mathematics, and writing skills questions and identify areas of the three test sections you are least confident of passing. Where is this kind of exam preparation available? 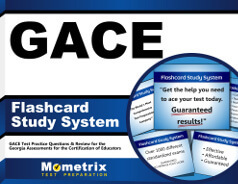 Mometrix study materials help you to identify your challenges and focus your study time for success on the GACE Program Admission Assessment. Are you eager to get started right away? Navigate to the online Mometrix Academy Free Practice Test with sample reading, mathematics, and writing questions. How did you do? Would you benefit from more practice testing? The Mometrix Program Admission Secrets Study Guide, available in print or downloadable e-book formats, provides test takers with a comprehensive approach to GACE preparation. The Secrets Guide includes multiple practice exams for each section of the GACE Admission Assessment, as well as advice on studying, remembering, and applying content on the day of the test. Common problems, such as test anxiety, can be alleviated when students master the Mometrix technique of guessing the right answers from the wording of the questions. The Secrets Study Guide authors are testing experts, and if you aren’t, you need this book. If remembering what you already know is your greatest worry about acing the GACE Program Admission Assessment, put your fears to rest. Mometrix Flashcards place success in the palm of your hand. Each card in the deck poses a question about a testable concept, theory, or set of procedures in reading, mathematics, or writing. The correct response is on the flip side of the card. Work through the cards and repeat the question prompts until you can’t forget the answer. Study the flashcards alone or with friends. This Mometrix product won’t let you down.